Love the house. Have stayed there several times dating back to 2007. Need to keep the humming bird feeder full. One of the special memories is the humming birds flitting around. Also need to replace the coffee maker. Those are two minor complaints, but it is an exceptionally well cared for property. Also have lots of cross country bike routes I ride each year that circle back to the property. So many great fire service roads in the area. We all loved it. Brought our grandchildren of various ages and there were activities for everyone. Plenty of space to spread out. Great shorefront and convenient location with friendly people everywhere. Amenities were excellent. No complaints at all. Everyone was pleasant. We enjoyed everything about our stay. The cabin was clean, very comfortable and had great views of the lake. The cabin was very easy to find and the location was perfect for our plans of visiting the state parks to view all of the local waterfalls. The staff was very nice, both on the phone and in person. I feel that chateau levoux could potentially be a hidden gem on the north shore. The location and views can't be beat. Thanks for the good service again! Very nice place to stay. Great shore, great views from the huge windows and very private for its location close to town. Very good use of space inside and comfortable. Nice job on renovating the dining and living floors. Much easier to clean. Very accommodating and patient staff! Absolutely enjoyed our stay in this beautiful home! The view of Lake Superior was incredible! Imagine sitting on the deck with a cup of coffee, listening to the waves and loons. This is definitely one of the most peaceful places we have ever visited and are already looking forward to staying here again next year! Thanks homeowner and Cascade! Very professional and customer focused. I appreciate being able to rent online and the rental process was seamless. When I called the office to report the minor issues the rental manager was apologetic and receptive to my concerns. This is my second time staying at Caribou Escape. My family and I like the lay-out of the house, full-size kitchen, private dock, and lack of TV. We also like being close to Lake Superior and both Grand Marais and Lutsen. We appreciate being able to bring our dog to the property. 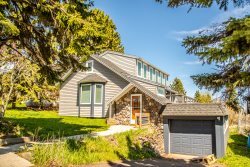 Clean and comfortable place with wonderful views of Lake Superior. Easy access to places of interest. Wonderful place. Beautiful views and very comfortable. Pretty good experience. Like I mentioned about them being able to find us another cabin, which worked out well for us. We loved this cabin. I would stay there again in the future. Very spacious.